Exercise machines that isolate individual muscles are great for general strength training. Muscle isolation helps you understand the different muscles of the body and their actions. The machines are also user-friendly, safe and efficient.Diagrams for how to perform the exercise / movement are provided on most machines. You need only to sit or lie on the padded portion of the machine, move the weight pin to the desired resistance and proceed. Time is never spent on lifting, loading and unloading heavy weights. All of the above make these machines popular in most fitness centers. 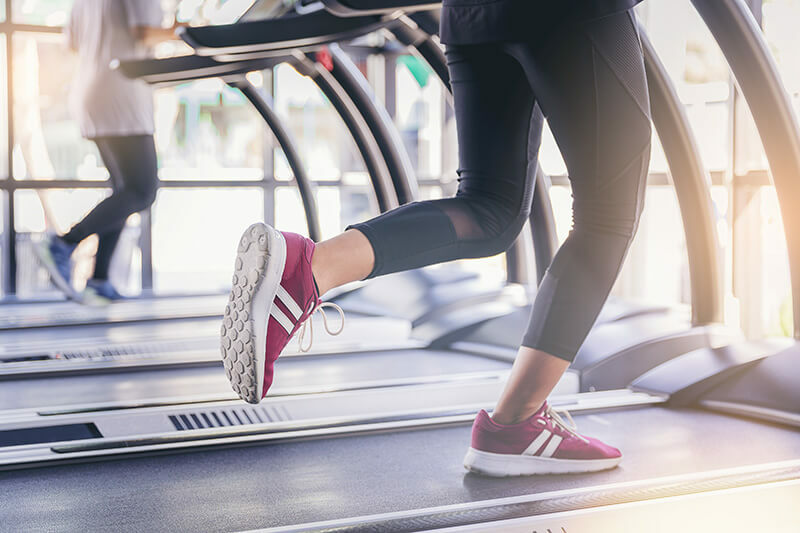 The machines require minimal supervision and the safety features are beneficial to gym patrons and owners. The potential for gym-related injuries is minimal compared to use of free weights like barbells and dumbbells. With this said however, minimal risk means there is still risk. Injuries do occur. In most of these cases, the cause is user error. One of the most common of these errors is failure to utilize proper form. Proper form involves stabilizing the body areas that are not exercised by a machine. Diagrams on the machines usually depict proper form. Unfortunately, most exercisers only use the diagrams to get the “general idea.” Proper form requires a closer look. You need to look at all regions of the body depicted in the diagrams, not just the region that will be involved in performance of the exercise. Gym members frequently resemble contortionist while using strength machines. They twist, lunge, heave, jerk and strain their entire bodies while using the equipment. This is a sure indicator that the individual is attempting to lift too much weight. The twisting, lunging, heaving, jerking and straining are efforts to recruit other muscles to help lift the weight. The isolation principle is lost, the exercises lose their effectiveness and the possibility of injury escalates. The key to success when using a weight machine is establishing specific points of body contact with the machine for both action and stabilization. Action contact points are created by the arms and legs as they grip, push or pull the parts of a machine that move during the exercise. For exercises involving the trunk, the abdomen or back may create the action contact points. The action contact points are easy to establish, as without them the machine will not move. Figure 1A and 1B: The Chest-Bench Press Exercise. 1A: Proper contact; the hands are the active points of contact, while the stabilizing points of contact are the feet, buttocks, upper back and head. 1B: Improper contact; the hands are the active points of contact; however, the stabilization points of contact are not well-established. The feet are not set properly, and the upper back and head are not in contact with the machine. Photo credit: Leigh Ann Osborne, Vinton, Virginia.It is the stabilization contact points that are the primary focus here. There are five common stabilization contact points; the two extremities not involved in the exercise movement, the buttocks, the upper back and the head. These areas should be in contact with the padded portions of the machine. 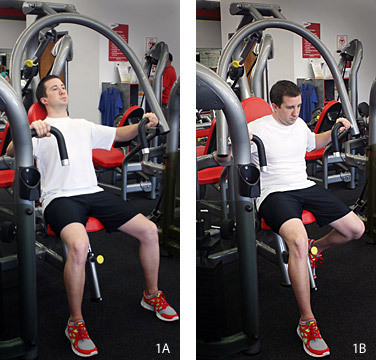 When you employ proper form utilizing appropriate points for active and stabilization contact, exercises using strength machines are safe and effective. Otherwise, there is risk of injury and gains in fitness are minimal. A frequent response by exercisers attempting to change from poor to good stabilization habits is, “I can’t lift as much weight the new way. I’m stronger than that.” It is true; they are not lifting the same amount of weight as before – but, reiterating a previous point, they were not lifting the previous weight with just the muscles the machines are designed to isolate. They were lifting (heaving, straining) with their entire bodies. Proper form in strength training cannot be overemphasized. Some strength machines require that you lie on your abdomen or back. Contact points are important in these exercises as well. For these machines or any others you may choose to use, follow these simple rules for stabilization contact points. Try to maintain as much body contact with the padded portions of the machine as possible. Figure 2A and 2B: The Leg-Press Exercise. 2A: Correct contact; the feet are the active points of contact while the stabilization points of contact are the hands, buttocks, upper back and head. 2B: Incorrect contact; the feet are the active points of contact; however, the stabilization points of contact are faulty. The upper back and head are not in contact with the machine and the exerciser is pushing downward with their arms. Photo credit: Leigh Ann Osborne, Vinton, Virginia. Keep the spine as straight as possible during the entire exercise. This includes the neck. Alignment from the back of the head to the lower back should be as straight. The head should be in a neutral position. The chin should not be flexed to the chest, and the head should not be tilted back or rotated to the right or left side while performing the exercise. Exercise is safer, more effective and more enjoyable when it’s done correctly. The result is that you are more likely to continue to exercising and maintaining a healthy lifestyle. Following these simple instructions will help in this endeavor. Remember, whenever you have questions about which exercises you should be doing or how to do them correctly, ask a fitness professional with training and experience for help. Exercise is important enough to do it right. Matthew Marry, DC, is a former athletic trainer for the National Football League’s Detroit Lions and a 2010 graduate of Palmer College of Chiropractic. He practices chiropractic at Foley Health and Fitness Training in Blacksburg, VA.